Kilims are carpets or rugs woven using a tapestry technique. 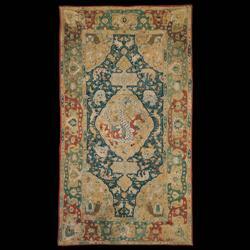 This kilim, which was made in Safavid Iran, is woven in silk couched with gold and silver thread. The décor shows scenes taken from classical Persian literature. The central medallion depicts Bahram Gur, the legendary Sassanid king, fighting the dragon, a scene taken from Firdawsi’s national epic, the Shahnameh. The king embodies the canons of masculine beauty in vogue at the Safavid court during the seventeenth century. The spandrels render homage to the star-crossed lovers, Layla and Majnun, from Nizami’s Khamseh. Broken-hearted at the marriage Layla's father arranged for her, Majnun withdraws to the desert, where he lives as a hermit, eating only grass and living in harmony with the wild animals. In the foreground is the camel bearing a palanquin in which Layla has arrived. The relatively coarse quality of the weave and impoverished drawing of the spandrels led Pope and Ellis to assign a late date to this piece. The towns of Kashan and Isfahan, famed for their output of luxury tapestry weaves woven in silk embellished with gold thread have often been cited as possible provenances.